U.S. airports rejected the ad. But a British advertising association honored it with an "ad of the month" award. For some, Russia Today is a mouthpiece that spreads Kremlin propaganda around the world. For others, the state-bankrolled channel is a vital voice that offers different political viewpoints in an ocean of media monotony. Russia Today says attention-grabbing stunts like the billboard campaign are transforming its image from that of a Kremlin mouthpiece to an increasingly popular brand able to claw viewers away from much larger rivals like CNN and BBC World News. "When we were a quiet, little-noticed channel telling stories from Russia, our audience was negligible. When we started being really provocative … our audience started to grow," said Margarita Simonyan, the channel's editor. The channel — created five years ago and widely seen as a Kremlin project to improve Russia's image around the world — regularly reports on conspiracy theorists’ claims that the terrorist attacks in Washington and New York on Sept. 11, 2001, were committed by someone inside the United States — not by Islamic militants. As of Tuesday, one of the top-rated videos on the channel’s web site, RT.com, was a report about a conference in Pennsylvania for “truthers,” those who believe that the U.S. government had a role in the attacks. Last month, an episode of the show “CrossTalk” descended into chaos when its host, Peter Lavelle, was berated by the show’s guests for proclaiming that the people who perpetrated the Sept. 11 attacks were not fundamentalists. One of the guests, British journalist Douglas Murray, expressed outright disgust afterward. "I’ve never encountered a more incompetent presenter," he wrote on his blog. Asked by The Moscow Times about the show, Lavelle said it was a "fiasco" because he had not been able to get a balanced pair of experts. "Everybody was snowed in," he said. Critics like Murray maintain that far from improving Russia's image abroad, the channel has instead morphed into a platform for conspiracy theorists and other like-minded figures on the margins of debate — especially for those who espouse anti-American views. But Simonyan explained that controversy was vital and that polishing Moscow's reputation was not among Russia Today’s tasks. In a rare interview in her unassuming Moscow office, the sharp-voiced 29-year-old emphasized that Russia Today was not a Kremlin propaganda tool and said the growing channel — which now boasts a staff of 2,000 and broadcasts in English, Arabic and Spanish — strives to offer an alternative to mainstream Western media. "Our job is to tell the world about Russia and to report world news from a Russian viewpoint," Simonyan said. Yet strangely, Russia Today last year abruptly started calling itself just RT. Sources inside the station even say they are not supposed to refer to their employer as Russia Today at all, and the name no longer appears on employees' business cards. Simonyan flatly denied that a name change had taken place and explained that the station had only altered its corporate logo to attract more viewers. "We removed 'Russia Today' from the logo after many colleagues, also from foreign media, told us that it was diminishing our potential audience," she said. The logic, she explained, was that the country's appeal is too narrow. "Who is interested in watching news from Russia all day long?” she said. The rebranding, she said, only affects the English- and Spanish-language divisions, while the Arabic channel is still called Russia Today (Rusiya Al-Yaum). "For the Arab world, Russia has added interest as a result of old Soviet links," she said. Igor Reichlin, a partner with CNC Communications, a public relations agency in Moscow, suggested that such a rebranding was counterproductive. "'RT' is just meaningless. They are shying away from the difficult but feasible task of ridding the brand 'Russia' of its negative connotations," he told The Moscow Times. Simonyan denied that Russia Today was disguising its roots. “All of our anchors begin their shows with 'Hello from Moscow,'” she said. Others have questioned the channel's independence because of its links to the state-owned RIA-Novosti news agency, whose guiding principle is to improve Russia's image in the world. "The double remit of reporting and representation is a handicap for that organization. It would probably be better for RIA-Novosti to be given an explicitly independent remit, like the BBC or AFP," said John Laughland, director of studies at the Paris office of the Institute for Democracy and Cooperation, an pro-Kremlin think tank that focuses on relations between Europe and Russia. 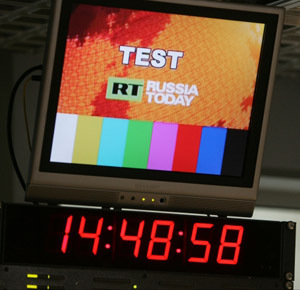 RIA-Novosti said in a statement issued last month that it is "neither a sponsor nor a backer of Russia Today" and merely participated in establishing the channel as an Autonomous Non-Profit Organization, which provided for its complete legal, editorial and operational independence. Simonyan, whose office is in the same building as RIA-Novosti’s, stressed that the station does not position itself as part of RIA-Novosti and that RIA-Novosti does not interfere in its editorial policy. She also said Russia Today never hid that it was funded by the government. "Probably many viewers of BBC World News also do not know that their program is directly funded by the British Foreign Office,” she added. Laughland, who is a frequent commentator on Russia Today, said the channel "fulfills an important role in the world media by airing views that otherwise might be ignored.” He also pointed out that by offering shows like “CrossTalk,” "whose very purpose is to encourage strong debate," the station was making a leap from its image as a propaganda tool. While Russia Today’s reports are clearly a far cry from the fawning news coverage on the country's national television channels, critics maintain that its editorial policy is overtly towing the Kremlin line by giving generous airtime to obscure critics of the United States. Last week, the station aired an interview with U.S. author Hank Albarelli, who claims that the CIA is testing drugs on people. Simonyan argued that the channel’s policy was merely to provide a platform for marginalized points of view that otherwise got little coverage, like the Sept. 11 conspiracy theorists. "I personally do not believe them. But I believe that if there are people out there who think so but do not get into mainstream media, they deserve an audience — and we should give them a forum,” she said. She added that giving airtime to “truthers” was morally comparable to Western media coverage of the 1999 apartment bombings in Moscow and two other cities that killed 293 people. "What about Western media reports saying that Vladimir Putin was behind the bombings?" she said. Some employees at Russia Today feel that this is a dead-end strategy. "I think it makes us look stupid. By giving airtime to all these crazy conspiracy theorists, we are really limiting our audience," said one employee, speaking on condition of anonymity for fear of reprisal. But Simonyan said viewer resonance and audience numbers confirmed that the strategy is right. Russia Today said that in a three-month period last year, the number of viewers in six European countries — France, Germany, Italy, Poland, Serbia and Britain — exceeded 7 million. In Washington, where Russia Today recently opened a glitzy broadcast center with five editing rooms and an 80-seat newsroom, the channel had a daily audience 6.5 times greater than that of Al-Jazeera English and a monthly audience five times greater than Deutsche Welle last year, Simonyan said. The editor takes pride in the fact that the channel has conquered new heights on the Internet, which she described as "the future of television." By Tuesday, Russia Today's videos had garnered more than 83 million views on YouTube, and on many days its clips get more views than other major news organizations, she said. YouTube currently ranks Russia Today ninth in its “News & Politics” section (YouTube.com/Channels) and 35th overall in this month's channel ranking. Yet critics have called the channel a huge waste of money, arguing that its 2008 budget of reportedly 3.6 billion rubles (then worth $147 million) was disproportional to its viewership. Simonyan said "such criticism can only come from people who have no idea of audiences and financing" but refused to say what the channel's current budget is, explaining that it was "unclear" if it was legal for her to disclose it. She added that the budget is significantly less than Deutsche Welle’s but significantly higher than the initial $30 million in 2005 "because in 2009 there are three Russia Today channels, not one." German broadcaster Deutsche Welle has an annual tax-financed budget of 275 million euros ($374 million), but that includes radio, television and Internet services in 30 languages. Its television division's budget for 2010 is 84 million euros ($116 million), Berthold Stevens, a spokesman for Deutsche Welle said in an e-mailed statement. “Our budget is really small. There are Chinese projects that will get $7 billion this year but whose audience is significantly smaller,” Simonyan said. Simonyan said it was good that countries like Russia are spending money to make their voices heard "after so many years in which the international media scene was reduced to the points of view of Anglo-Saxon countries." Russia Today also offers more traditional news fare, including interviews with leading newsmakers like Foreign Minister Sergei Lavrov and State Duma Deputy Andrei Lugovoi, who was wanted by Britain in connection with the 2006 poisoning death of former security officer Alexander Litvinenko. Mikhail Fedotov, chairman of the Union of Journalists, said Russia Today's main problems, apart from a lack of trust because of its perceived closeness to the state, were created by the very state that founded it. "To improve Russia's image, we need change within Russia," he said. As an example, he pointed to the harassment last fall of journalist Alexander Podrabinek by the pro-Kremlin youth group Nashi. Podrabinek was forced into hiding after Nashi held daily demonstrations outside his apartment following his publication of an article critical of Soviet military veterans. "Such incidents do more harm to the country's image than Russia Today can do good. Rather than building a television channel, it would be cheaper if the government just told Nashi to stop," Fedotov said. A search for the word "Podrabinek" on Russia Today’s web site yielded no results Tuesday.